Multi-Talented First Family of Roots Music Let Their Hair Down. 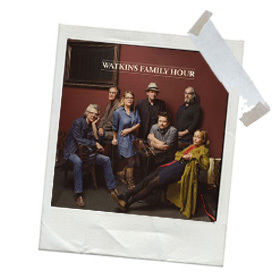 The Watkins Family Hour is a monthly show by Sara and Sean Watkins and a host of friends; some famous; others less so and it takes place at the Largo in LA. What started out as a fun get together and a place to try out new ideas before the multi-talented multi-instrumentalists went in the studio; has become a ‘must have’ ticket for music fans all around the West Coast. Album opener Feelin’ Good Again has Sara never sounding sweeter; as an acoustic guitar gets played within an inch of it’s life while a pedal steel and possibly the best pick up band in the land; accompany her. The song is an absolute delight and the minutiae in the detail is mind boggling. I’m not normally a fan of boy/girl duos alternating tracks; as invariably one has a much stronger voice; but I will make an exception here as Sean is every bit as good as Sara in the vocal department; and I can’t separate the two for you. Sean’s first song is Not in Nottingham; which features some divine fiddle and piano playing; while Sara provides lush harmonies in the background. Just when you think you know where they are going; the Watkins’ throw a curve ball with the New Orleans Honky-Tonk, plinky-plonk piano and gipsy fiddliscious Prescription For the Blues; with Sean playing the Hoagy Carmichael role. Before I played this album I was worried that, because of the quality of the musicians involved it could get a bit po-faced; but nothing could be further from the truth. This is a well marshalled group of top-notch players having the time of their lives in a very professional manner. Instead of showing off; the Watkins’ showcase their talents, using them sparingly at times, most noticeably on the dark and mournful She Thinks I Still Care. Sean sounds on the verge of tears as not a note is used that isn’t needed by the guitars, bass and fiddle. A thing of rare beauty. Sara gets to close the album with one of the finest songs I’ve ever heard her perform; Brokedown Palace. It’s a lovely song made excellent by her voice sounding as clear as morning dew. I will be staggered if this album doesn’t feature in the Awards ceremonies in the New Year; as it’s an brilliant example of what can be achieved in Roots/Americana music. Surely, you’re not suggesting Sara Watkins wrote Broke Down Palace ? It’s a well-know Hunter/Garcia (Grateful Dead) composition! As this was a download and the Press Release must have omitted that fact; combined with me not being an old hippie I wasn’t aware. I can only apologise if this has caused you to lose sleep.